For those who are unaware, One Piece is set in a mainly ocean bound world which only one man ever succeeded in circumnavigating - the 'pirate king' Gol D Roger. Roger discovered the worlds greatest treasure, the legendary One Piece, before eventually being captured by the Navy, and at his execution he declared to the watching world that he had left his treasures somewhere at the end of the Grand Line, the world's most dangerous sea. His words ushered in a golden age of piracy as adventurers and rogues flooded the oceans to claim his wealth and position, and 22 years after his death another young man heads to sea with dreams of becoming the pirate king - Monkey D Luffy. 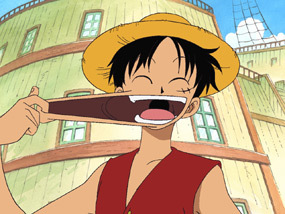 Luffy is inspired by the great pirate Red Haired Shanks who saved him when he was a young boy, leaving him his trademark straw hat and indirectly granting him a strange new power when he accidentally ate a Devil Fruit discovered by Shank's crew. The Devil Fruits grant bizarre new powers to whoever eats one, but at the cost of their ability to swim, and the one Luffy ate gave his body the properties of rubber! Unperturbed by his inability to swim, lack of navigation or sailing skills, lack of a crew and lack of a ship, Luffy sets out to sea armed only with ambition and enthusiasm and sets about the task of finding a ship and crew who will sail with him to the Grand Line! heavily and shoddily before eventually giving up on it after a wave of fan ire and poor sales (we still maintain that the theme tune was awesome though). However, since then it's been picked up by Funimation, who left it uncut, gave it a new English dub and eventually started releasing it in 24 episode box sets, and it's this version that Manga have used for its UK release. With Dragon Ball Z, Naruto and Bleach all out in the UK, One Piece was really the biggest series not to make it to our shores, and on the evidence of this set you can see where its popularity comes from. One Piece starts as a quite straightforward comedy adventure, more in the style of the original Dragon Ball series than the more fighting-orientated Dragon Ball Z. 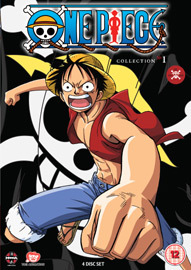 This first collection sticks pretty closely to the manga, following Luffy through four story arcs as he battles against several enemies and recruits a handful of crewmembers, including the notorious bounty hunter and master of the 'three sword style' Roronoa Zoro. 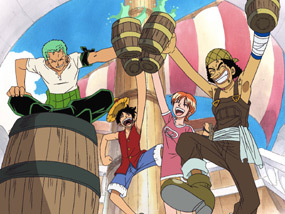 The first story arc covers Zoro's recruitment and the liberation of a port town from the tyrannical rule of Navy Captain 'Axe Hand' Morgan, and from there Luffy and Zoro face progressively stronger foes in the form of the vicious pirates Buggy the Clown, Captain Kuro and Don Krieg. So far, so Dragon Ball Z. However, where One Piece sets itself apart is in the story, the action may be a major part of the series but it's all underpinned by a strong narrative which provides a back story and motivation for the actions of many of the characters. In this volume it's Zoro's story that's most engrossing, he is fighting to become the world's strongest swordsman to fulfil a vow he made with a friend who died young, but he learns how far he has to go when he encounters the legendary swordsman Dracule 'Hawk Eyes' Mihawk. It's not common in these kinds of series that one of the heroes faces an opponent they have no hope of beating, and it's moments like this - and the backstory of the chef Sanji - which really sets the series apart from the crowd. Showing the characters' back stories and showing the hardships they have faced demonstrates the hard work they have undertaken to be where they are, and makes them easy to root for and identify with. The series' own unique brand of humour also adds a lot to proceedings, balancing out the darker moments of the story with plenty of slapstick, visual gags and wordplay. It makes for a very watchable combination, and like Dragon Ball Z it can be addictive viewing. but it does seem a bit primitive in comparison to some other long running series. However, it gets away with a lot due to its cheerful and cartoony style. The series is packed with exaggerated and frequently bizarre characters even before others with Devil Fruit powers appear, the Michael Jackson-esque hypnotist Jango and Buggy's circus-themed henchmen being perfect examples, and the series feels fun even with its frequent moments of drama. One Piece Collection 1 is a hugely enjoyable anime release, packed with action, drama and plenty of comedy. It's highly entertaining and highly watchable despite not being the finest in the visual department, and it's packed with memorable and likeable characters. Luffy is a great protagonist even if Zoro takes centre stage at points, and it's refreshing to have a main character who doesn't appear to have secret hidden powers like so many others - Luffy's power is out in the open, it's pretty ludicrous and the inability to swim it provides is a major obstacle to his dream of becoming a pirate. Luffy doesn't have all the skills he needs, he spends years mastering his powers and only heads to sea when he feels ready, prioritising finding companions to help him achieve his dream. It's great to see a lead character who doesn't believe solely in his own strength and doesn't shy away from others, and it's his cheerfulness that sets the tone of the series as a whole. There are a few weaker stories and characters - the man-in-a-box Goemon and Krieg pirate officer 'Invincible' Pearl spring to mind - and the series is certainly more cartoony and less serious than the likes of Naruto and Bleach, which can make it seem more childish than it really is. However, it is highly entertaining, and with 26 episodes in this collection it's great value for money too. Well worth a look. The usual clean opening and ending sequences and commentaries from the American voice cast for episodes 1 and 17. Interestingly the clean credit sequences feature the English language versions of the songs as well as the Japanese ones.